Guwahati Gana Seva Sangh (GGSS), one of the partners under FARM NE came up with a noble idea of developing organic vegetable gardens in rural school campuses. This was after Caritas India suggested to all of its partners to celebrate World Environment Day way back in June 2014. GGSS, under this campaign shared its willingness to motivate children from the project villages to take up organic practices. GGSS also intended to initiate kitchen gardens in schools with an aim to target the mid day meal, where children could be fed with fresh vegetables grown by themselves. The Zonal team gave an immediate go ahead and a classic case of people’s movement started taking shape. Initially we approached the village elders that also included members of the school management committee, to share this idea. They immediately gave their consent said Prabin, the Coordinator of the project (FARM NE). One Lower Primary (LP) school was selected in No. 2 Oujari village for the noble programme. The village in question saw use of chemical inputs in agriculture in the past but presently, farmers here have began to practice organic agriculture after interventions made by GGSS & Caritas India. Thanks to the sensitization of the community by GGSS on the negatives of chemical based agricultural practices. 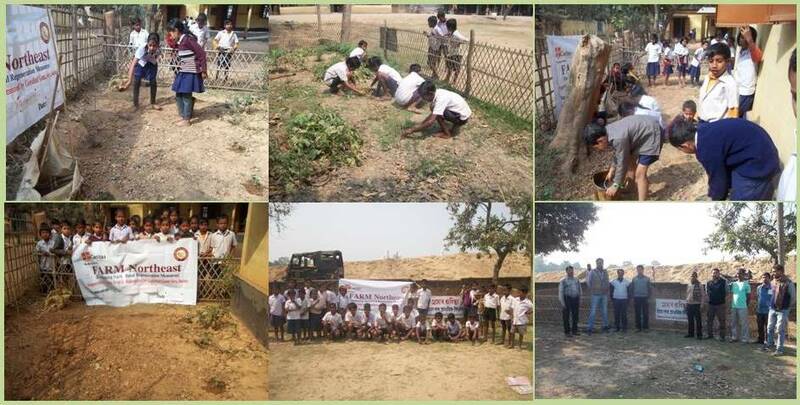 The idea of school kitchen garden started showing colours when school authorities in association with GGSS initiated the activity in the school campus. “It may be a small step towards protecting the environment, but visualizing the threat it poses in the future, environmental awarenes among the children is a must” said Mr. Sonakanto Das, President of School management committee, 2 No. Oujari village”. GGSS requested the community of 2 No. Oujari village to donate local seeds for the kitchen garden. It was amazing to see the response when the community not only donated seeds but also cow dung for manure. It was the turn of the children to take the lead now. Students from standard I to V were all rearing to go for it. “We feel happy to be working in our kitchen garden as this is something new to us” said Ms. Puja Sarkar standard V of the school. The teachers & the school management supported the movement whole heartedly along with the students. It all started during August 2014 and during December-January 2015, a variety of vegetables like cabbage, cauliflower, chilli and gourd etc were grown by the children. The principal of the school Grinendra Bharali shared during a visit by Caritas India official in March 2015 that they have made this activity as a part of the curriculum and they award marks as per the students’ performance in the kitchen garden activity. The students, as per the teacher are so excited that they are competing each other to take part in the activity. Caritas India official while appreciating the teacher along with management committee & community of the school, requested them to encourage this kind of activity among the children so that they understand the value of organic agriculture. An act of good deed spreads like fire and this is precisely what happened in this case. The school management committees of other 3 LP schools in Gaondimoria, Khaloibari and Lumsum Gaon villages respectively are so much inspired by the seeing the involvement of the students and the management committee that they have also started similar process in their respective schools. The children of 2 No. Oujari village are here to & inspire the world with the message of becoming the true custodians of nature & natural resources.